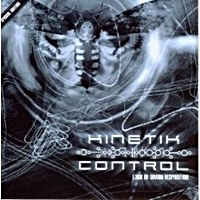 When I read that there was a possibility to review Kinetik Control, I had somewhere in my head a voice which said that this was a progressive metalband. When I received it and put it on, I came to the conclusion that I was mistaken. Kinetik Control plays a genre that is not my favourite (because you never know who reads this, I express it this way) otherwise I would have said: "I don't like it any motherfucking bit". But it would not be fair to the band to completely ruin what they do because I don't like the genre. The band combines styles of HIM, Deathstars, Beseech and Faith and the Muse. You get a kind of electronic, gothic, darkwave kind of popmetal. The vocals of Tweak remind of Depeche Mode. Besides their own songs, there is also the cover "What Is Love", originally done by Haddaway. I think the original song is much better. One thing is sure, the production is o.k., and the Finnish members control their instruments well. I will put the CD back on the shelves and I don't think it will be back in my stereo, at least not as long as I live I guess. For those of you who like the above mentioned bands this record will be not a bad one to at least give a listen. Two ratings: 25/100 (this is what I really think about it) and 75/100 (when you like the genre).